CNG: eAuction 438. GALLIA LUGDUNENSIS(?). Æ As (26mm, 18.43 g). Countermarks applied during the reign of Tiberius, AD 14-37. 438, Lot: 329. Estimate $100. Sold for $160. This amount does not include the buyer’s fee. GALLIA LUGDUNENSIS(?). Æ As (26mm, 18.43 g). Countermarks applied during the reign of Tiberius, AD 14-37. 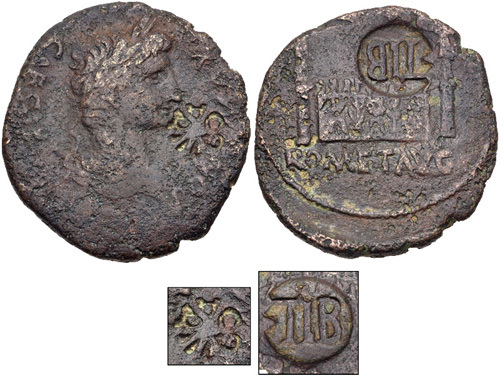 C CARN countermark punched in wheel-shape and TIB in circular countermark on a bronze as of Augustus. Pangerl 13 and 29. Host Fair, c/m’s Fine and VF, brown patina, some roughness. From the Richard Baker Collection.